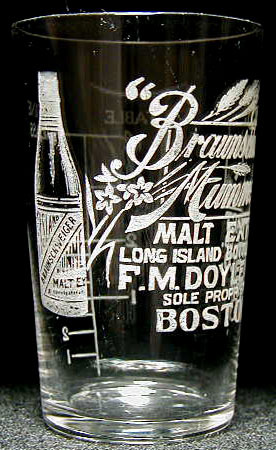 Inscription: Braunschweiger / Mumme (both lines script) / MALT EXTRACT / LONG ISLAND BOTTLING CO. / F.M.DOYLE & CO. / SOLE PROPRIETORS. / BOSTON. (First two lines are in script with a frosted rectangle outline behind, partly shaded in lower right corner. A bottle of the product is at far left of the glass with stalks of grain and flowers exending to the right such that they intertwine with the brandname. Rear of glass has measure lines in TABLE, WINE / GLASS and TEA). Dimensions: 3" x 1-15/16" x 1-7/16"
Condition: Aside from the usual fine scratches from handling, the glass is mint!